I have been thinking about recommending the website of a monthly local magazine Lochaber Life for some time. Although it’s delivered free of charge to over 11,000 households in the Lochaber area every month, the great news is the whole magazine is available to view online. Over the last year the magazine has run a feature about the geology behind our local landscape in conjunction with Lochaber Geopark (perhaps I will feature that particular organisation in a future blog posting). I have always been fascinated with the world around us and when out in the hills I marvel at the complex nature of our countryside and think about the gargantuan forces that shaped it. This monthly feature answers a lot of questions about the landscape around us with an engaging not too technical style. 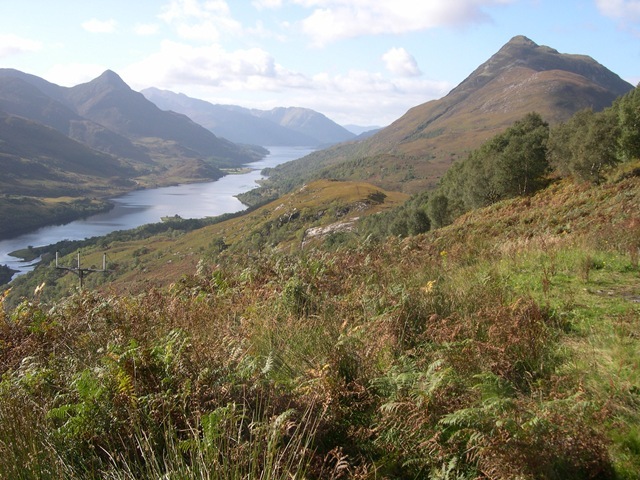 So if you are planning a walking trip in Lochaber or are just interested in how the landscape was formed, take a look. A long weekend away with my parents who live on the edge of the Brecon Beacons National Park gave me the opportunity to walk in a different area than usual. Having my father on hand meant that I could rely on someone else to do the driving and ferry me to starting points and back from the finish. I headed up into the Black Mountain (not to be confused with the Black Mountains found on the eastern side of the national park) and the peak of Fan Brycheiniog. 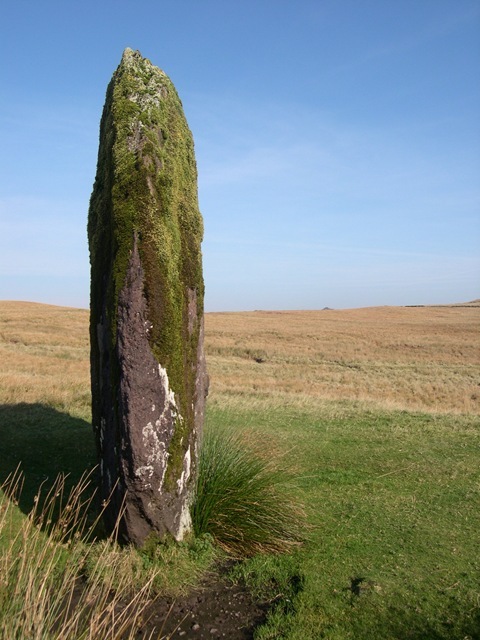 This was a fascinating walk that makes me yearn to learn more about the geology of the British Isles. Walking parallel to the steep escarpment of Fan Hir, I wondered at the sheer geological forces that shaped this landscape over many millennia. As an amateur I can only guess at what created the tall heavily striated cliffs – was this the site of a large glacial lake – the rising and falling of the ice sheet scouring deep gouges in to the cliff face similar to the parallel roads found in Lochaber? I really must put an introductory or idiot’s guide to geology on my Christmas book list. 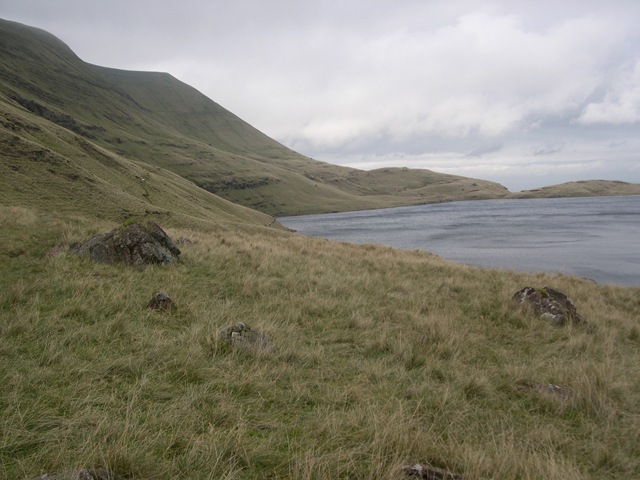 Feeling much fitter and more energetic than my last hillside excursion I soon made good time to the mountain tarn of Llyn y Fan Fawr where some convenient rocks provided seating for lunch. I was marvelling at the solitude surrounding me when invading armies of walkers appeared from every angle all homing in towards the tarn. They too had decided this was the perfect place to stop for lunch. A clear path leads steeply from the tarn to the windy Bwlch Giedd where strong gales awaited me. 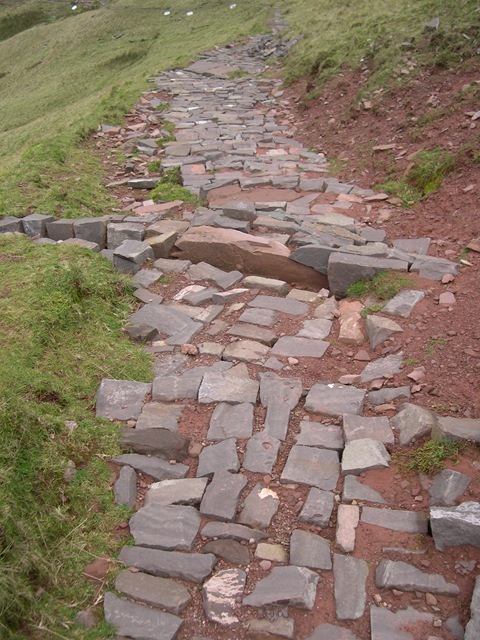 The path is undergoing restoration by the national park authority and they are doing a very impressive job. Often I have found that path restoration seems to amount to throwing down as many large stones and rocks possible without any thought of constructing a new path. 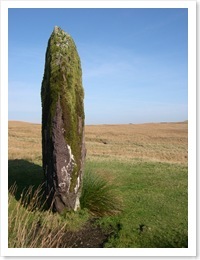 The uncomfortable result encourages walkers to walk to one side along the grass bank exacerbating the existing erosion. The restoration up to Bwlch Giedd is a beautifully crafted piece of hillside engineering and will be a delight to walk on when completed. I would normally stroll along ridges like this enjoying the wide panoramic views on offer, but on this occasion I hurried along propelled by my own legs and the fierce wind. I dashed past the summit trig point on to the cairn at the end of the ridge before making an abrupt about-turn retracing my steps down to Bwlch Giedd and up to the Fan Hir ridge. The path skirts close to the escarpment edge giving tantalising glimpses of the sheer cliffs dropping below, but this was not a day to get tempted too close to the edge as one gust could have meant a Mary Poppin’s moment into infinity. Instead I opted for the more conventional descent continuing along the ridge line back down to the river. A substantial gap between weather fronts on Sunday meant that I was able to get up into the mountains and enjoy a long walk without the prospect of getting wet. That is always a bonus when you live in the Highlands. 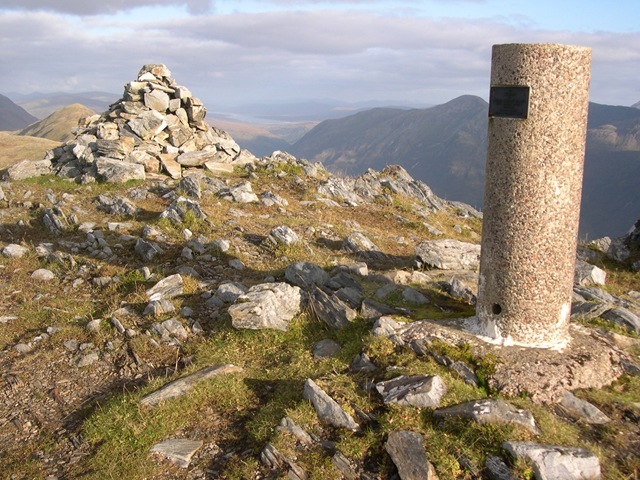 So I headed off to one of my nearest mountains, Mam na Guillain, that stands beside Loch Leven, to write a walk route for the walkhighlands website. Having not been hill walking for over six weeks, I was amazed that I had lost a considerable amount of hill fitness in such a short amount of time. After the long walk along the West Highland Way to the beginning of the ascent from the Callert stalkers path, I struggled up the steep grassy incline towards the summit. The warm autumn sunshine did nothing to ease the feeling of fatigue and with great relief I collapsed at the foot of the triangulation point at the top. Refreshed with a flask of tea and my spirits lifted by views deep into the Glencoe moutains to the south and way beyond the Nevis range to the north, I headed along the ridge towards Kinlochleven. Ahead of me was Beinn na Caillich, “the old man” that towers above the village guarding the upper regions of the loch. This is a far more interesting mountain than the Corbett sized Mam na Guallain. Beinn na Caillich can be seen from all points of the village as it beckons you to put on your boots and head for the hills. In no time I was at the summit and with the last rays of daylight beginning to streak down the loch behind me I headed down the long descent back to the West Highland Way. I did something foolish during this walk, I only stopped once for something to eat, and I began to regret that on the descent. I started feeling slightly dizzy and light headed, but with the gathering gloom I kept walking. Eventually, I forced my self to stop, devouring a bar of chocolate and a bottle of sports drink. I am sure if I had proceeded much further I would have passed out. Fortunately the peaty shoulder upon which I was walking would have cushioned any fall but elsewhere I would have landed on rocks. This would have been extremely serious as I was walking on my own. The lesson from this walk is to listen to my body when it begins to scream, stop, and rest. Above all I should always carry a quick energy solution in my pocket so that I don’t have to decide between stopping or pressing on. It seems that I am not the only one to be sporadically posting to their blog over the last month, as many other outdoor bloggers have recently posted apologies for the famine of postings. The only excuse that I have is that a number of major events all came to a conclusion in the same week including two OU exams and the opening of a community centre in the village, of which I am Chairman. Now with all those things behind me there are no more excuses.